With its brilliant blue skies, vast number of sunny days and spectacular landscapes, do-it-yourself movers with an affinity for outdoors living have made Kamloops No. 7 among the U-Haul Top 10 Canadian Growth Cities for 2015. 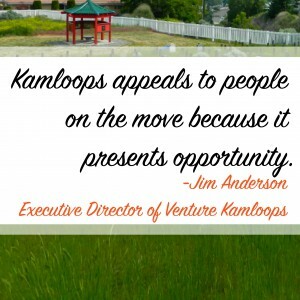 “I think people move here because of our central location, the broad scope of amenities, and the variety of activities you can do here,” Kamloops Mayor Peter Milobar said. Growth rankings are determined by the net gain of incoming one-way U-Haul truck rentals versus outgoing rentals for the past calendar year. U-Haul locations in this city saw 53.2 percent of truck rental customers coming into the city as opposed leaving. Despite the net gain, there was slightly less traffic in this city among do-it-yourself movers year-over-year, with a 5 percent drop in U-Haul arrivals and a 7 percent drop in departures compared to 2014 activity. Kamloops, with a population of roughly 85,000, has a reputation for being the friendliest city in British Columbia as well as “Canada’s Tournament Capital” for sporting events. Four major highways feed into the city, creating convenient access from destinations such as Vancouver, Calgary, Edmonton and Seattle. The residents here embrace the western heritage of their city, a ranching community since the 19th century where the “cowboy way” still plays a role today. Rodeos and cowboy festivals, music and other events are plentiful. While U-Haul migration trends don’t correlate directly to population or economic growth, the growth cities data is a strong gauge of how well cities are attracting and keeping residents. 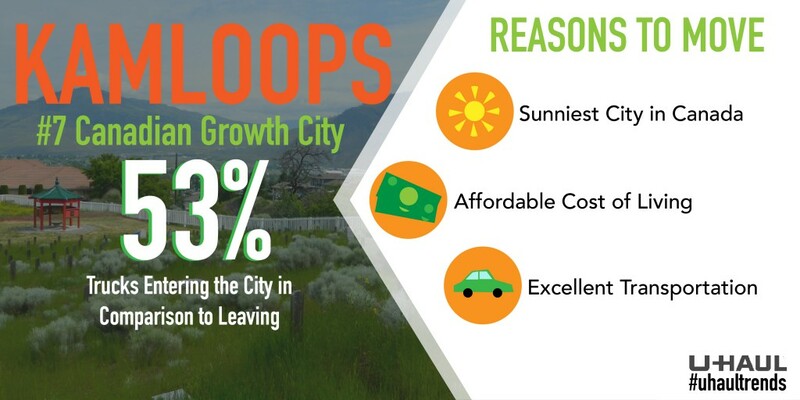 Kamloops is the second of four British Columbia destinations to make the Top 10 Growth Cities list for 2015. Continue following the countdown on myuhaulstory.com each weekday through March 4 to see the No. 1 city revealed. There are more than 2,000 hours of sunshine each year, making this city one of the sunniest cities in Western Canada. Kamloops is the premier host centre for all types of sporting and cultural events. In fact, $50 million has been put into renovating facilities to sell the city’s tournament initiative. Moving customers in Kamloops have easy access to four U-Haul neighborhood dealers – companies that supplement their primary businesses by serving their communities with U-Haul rental equipment and moving supplies. Gateway RV Mini Storage at 231 Andover Crescent is the latest to join the U-Haul network, signing up last October.